I recently wrote about a study of the gluten free/casein free (GF/CF) diet and autistic kids. The kids in that study were put on the diet and then given snacks with gluten and/or casein and their behavior was monitored. And nothing happened. Breaking the diet did not cause increases in autistic behaviors. But people complained that the study size was small (valid complaint, but not a killer) and that the kids in the study didn’t have GI disease (again, not a killer for the study. The GF/CF diet is marketed as a very general autism “therapy”). But I wrote the previous article knowing that another study had just come out. A study focused on kids with “severe maladaptive behavior” and a sign of the so-called “leaky gut” syndrome. Gluten and casein supplementation does not increase symptoms in children with autism spectrum disorder. The abstract is below. The researchers looked at 74 kids with “increased urinary I-FABP” I-FABP is intestinal fatty acid binding protein. And this is considered a “marker of gut wall integrity“. The study team found this marker elevated in a number of their subjects from a previous study. To our knowledge, our study is the first randomised controlled trial to study the behavioural effects of adding gluten and casein to the diets of children with ASD who were already on a GFCF diet. So, they had autistic kids who were on the GF/CF diet and they gave some of them gluten and casein snacks and the others GF/CF snacks. For a week. And they looked at the changes in behavior. 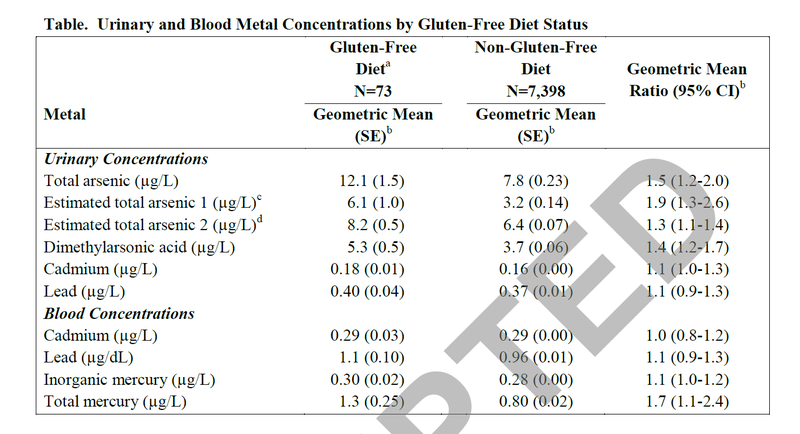 Both groups–those given gluten and casein and those who weren’t–saw improvements on measures of behavior. But there was no difference between the two groups on the measures of behavior. There was no regression. No children made more autistic by gluten and casein. In other words, no indication that the diet was doing these kids any good. A gluten- and casein-free diet is often given to children with autism spectrum disorder (ASD). We aimed to determine the effect of gluten and casein supplementation on maladaptive behaviour, gastrointestinal symptom severity and intestinal fatty acids binding protein (I-FABP) excretion in children with ASD. A randomised, controlled, double-blind trial was performed on 74 children with ASD with severe maladaptive behaviour and increased urinary I-FABP. Subjects were randomised to receive gluten-casein or a placebo for seven days. We evaluated maladaptive behaviour before and after supplementation, using I-FABP excretion, the approach withdrawal problem composite subtest of the Pervasive Developmental Disorder Behavior Inventory and the Gastrointestinal Symptom Severity Index. The mean approach withdrawal problem composite score was significantly higher before supplementation than after, both in the placebo and in the gluten-casein group. However, the mean difference was not significant and may have been caused by additional therapy. There was no significant difference in gastrointestinal symptoms and urinary I-FABP excretion. Administrating gluten-casein to children with ASD for one week did not increase maladaptive behaviour, gastrointestinal symptom severity or urinary I-FABP excretion. The effect of prolonged administration or other mechanisms of enterocyte damage in ASD should be explored. There are a lot of limitations with this study, and the authors do discuss them. But, frankly, if the GF/CF diet were as good as people claim, this study would have shown at least some benefit.